Time to stock up on boot-cut jeans. 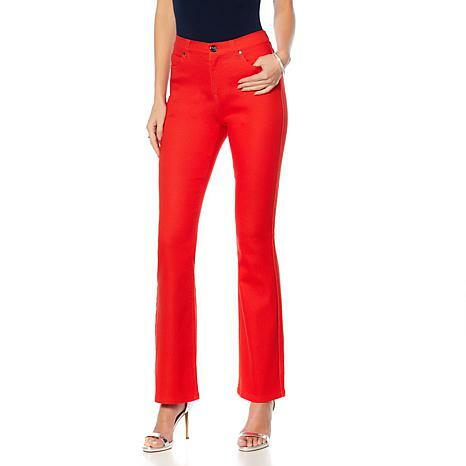 A woman just can't have enough, especially when they come in such great colors and comfortable fabric blends, like this virtual stretch denim. These have great stretch and recovery so you stay looking fabulous all day and all night. This is the 5th pair of DG jeans I have bought in the past year. Love the fit, the feel, love everything about them! All of my weight is in my tummy area. I am 5'4" and weigh 150lbs. 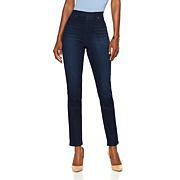 I wear an 8 in DG jeans..and depending if I want to wear just flats..I get the petitie..or heels..then regular length. Both fit perfect for my needs. 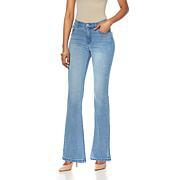 As usual, Diane can design pants/jeans and then be sure they are manufactured correctly. No cheap or sloppy clothes come out of her shop. Can't go wrong buying her stuff. The fit and the feel are what I have come to expect from DG2...they are great!!! Very nice. Soft. Did order one size down from what I usually wear as they recommended. Fit perfectly.